I had an intriguing wildlife experience yesterday, which naturally I have to share with my Grow It Eat It friends. You’ll remember my triple-layer garden fence, which we hoped would keep out the neighborhood critters. Well, turns out there were still improvements to be made. Last week I started noticing leaves missing from my sweet potato plants, and then the bean plants that never really got going were gone. I checked the perimeter of the fence and couldn’t find any holes. But a hole was chewed through the deer fence covering the lower gate, and the chicken wire had been worked loose. Fixed that – but still more leaves missing. Then I realized that the upper gate was wiggly enough in its setting that pressure on the bottom corner could allow a small creature to slip inside. My husband drilled holes and inserted a bolt that connects the gate to the frame – we have to unscrew it when we enter, but it keeps the gate steady. Yesterday morning I went down to inspect the garden, and had just squatted down to unscrew the bolt, when all of a sudden two – two! – young groundhogs ran in from opposite directions and appeared just in front of me, for all the world like two puppies hearing the door open and hoping to be taken for a walk. I yelled – okay, I screeched – and they both ran away, again in opposite directions. Then – after explanations to family and neighbors, who’d heard me making unusually high-pitched sounds, and much laughter – I entered the garden and found still more leaves chewed. I spent the morning finally getting to a lot of weeding I’d put off during Horrible July, including pulling down massive amounts of bindweed on the deer fence. If anything is managing to climb that fence, perhaps stripping the vines will help. I also found one place where all three layers of fence were broken through, but it wasn’t big enough for a groundhog – nor did I think the gate gap was big enough, though it’s always surprising how small these animals can make themselves when necessary. (I don’t quite see how they would get back OUT, though. Especially after all those sweet potato leaves.) Rabbits are a distinct possibility, though. I think we’re going to have to recover the gates with hardware cloth instead of chicken wire, and keep a lookout for fence breaches and put hardware cloth on those as well. I just planted some fall crops so I am determined to keep them safe! If it isn’t one thing it’s another, right? Hope you are keeping your crops protected from our furry friends. I'm hoping six-foot deer fence is beyond their capabilities, though I know they can get up the four-foot wire fence and I did see one place where someone seemed to have been sitting on top of it trying to chew through the deer fence (not successfully). 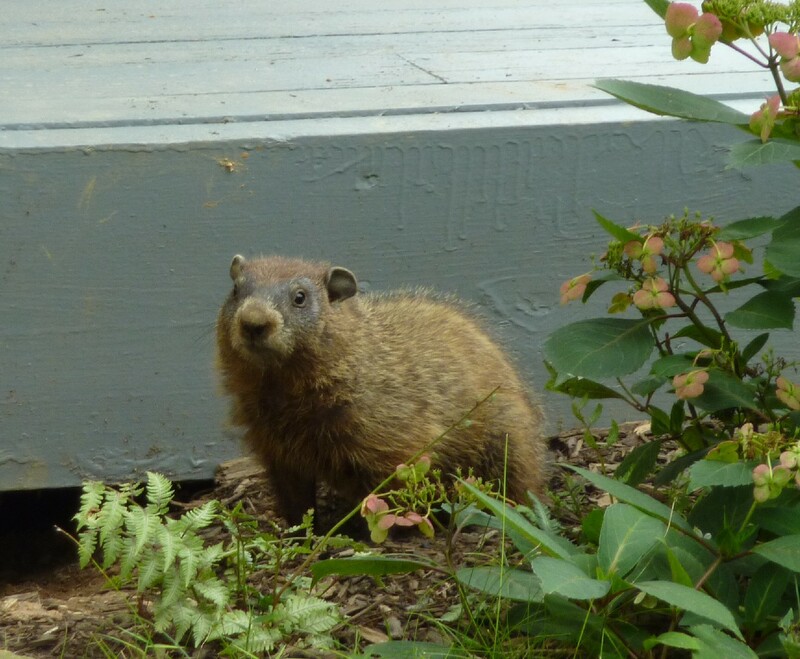 Our neighbors have a trap – unfortunately the older wiser groundhogs are too smart for it. I might try for the youngsters though. Hmm…not sure about the 6-foot fence, though I've seen groundhogs in trees higher than that. If you make the fence pliable so it falls backwards when they try to climb, they can't get any leverage up that high. To trap them, you need to outsmart them. Can you put the trap in a place where they HAVE to go through it (or go back the way they came)? Or find their hole and put the trap there when you know they're in there (and plug up other holes). I've had to get really 'smart' to capture those I've gotten over the years. Watch their habits, and then use that info against them. This is WAR!!! Yeah, it's been war for years here too. And come on, it's not like I don't leave them plenty of weeds to eat outside the fence! I had problems with these critterse early in the season and had to replant my veggies 3 times. I finally borrowed a trap from a friend and within 2 days had trapped a huge groundhog. We relocated him and I set the trap again. By the enxt day I caught another one, which we relocated as well. I did NOT have any more damage the rest of the season. That is a great success story! I think I'd need to trap about fifteen of them… but with time it may be possible.